Music, poetry and downright nonsense are the order of the day in Elephant’s Eggs in a Rhubarb Tree, a children’s show which promises to bring the writings of T.S. Eliot, Spike Milligan, Michael Palin and Hilaire Belloc to the attention of the young audience. 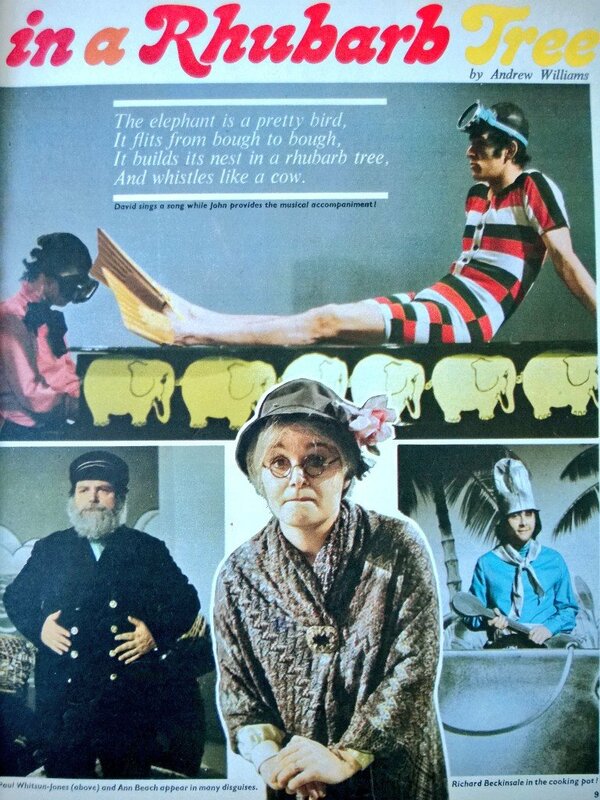 Presented by Richard Beckinsale, the rather rotund Paul Whitsun-Jones, all six foot three of David Rowlands, the piano playing John Gould and, finally, the main singer Ann Beach, Elephant’s Eggs in a Rhubarb Tree is even more barmy than its constituent parts sound. Expect limericks about a young man from Bengal falling foul of a dog in a hall, Richard embarking on a spot of hippo hunting and the curious sight of David in swimwear and flippers perched atop an elephant emblazoned piano being played by John. Compiled by Ian Davidson (The Two Ronnies, French Fields, Sorry! 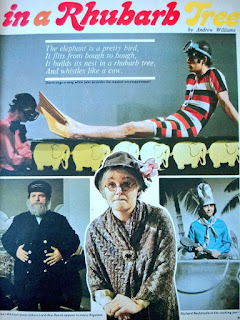 ), six episodes of Elephant’s Eggs in a Rhubarb Tree were produced by Thames Television with Pamela Lonsdale (the creator of Rainbow) acting as the series’ producer with Robert Reed directing. The 25-minute episodes were aired on ITV in a 5.10pm slot on Mondays. Elephant's Eggs in a Rhubarb Tree was never repeated and all six episodes of the series are currently listed as missing from the archives. Presented by Susan Stranks of Magpie fame, Paperplay takes paper, little dabs of glue, pens and various household objects to create mini paper masterpieces. Aided by yellow, squeaking spider puppet Itsy and the orange, rasping arachnid Bitsy, Stranks digs deep down into her creative spirit to create hot air balloons, conjure up a family out of pencils, cotton reels and cotton wool as well as showing viewers how to construct a skating rink. Set against a black background, to help hide the black clad puppeteer Norman Beardsley, Paperplay is also home to a number of other occasional puppets such as Cardew the caterpillar, Boris the ladybird and Katie the bird. Taking budgetary restrictions and making a show that effectively makes them the centrepiece, Paperplay provides plenty of paper based fun for children to get involved with. While Paperplay certainly can't be classed as a riveting watch, there’s enough variety and creativity on offer to temporarily pique the interest of an errant, young mind. The 15-minute episodes of Paperplay were produced by Thames Television for ITV and ran as part of the lunchtime ITV schedule over the course of eight series. Paperplay was the brainchild of Susan Stranks who presented the entire series with Vic Hughes (Spooky, Chocky, The Tomorrow People) producing the first series and Charles Warren (Wonders in Letterland, Button Moon, C.A.B.) taking over the rest of the run. 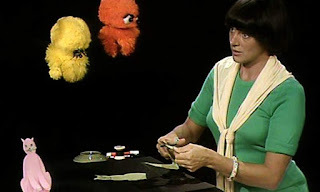 Repeats of Paperplay aired until mid-1981. During the dismantling of the church of St Cuthbert, a stone idol which dates back to pre-Christian times is found hidden amongst the stones. Known as a Grinnygog, it has remained hidden there since the 17th century when it’s three guardians – a trio of white witches – were the focus of an angry witch hunt. Following the disturbance to the Grinnygog’s surroundings, these three white witches awaken from their rest in the marshes. Finding the church dismantled and gone, the three witches – Miss Bendybones (Patricia Hayes), Mrs Ems (Sheila Grant) and Edie Possett (Anna Wing) – go in search of their Grinnygog. The sudden appearance in the village of the three witches, however, doesn’t go completely unnoticed and five childen begin to pay a keen interest. The three Firkettle children – Jimmy (Paul Curtis), Dave (Adam Woodyatt) and Essie (Zoe Loftin) – are particularly intrigued, especially given that it was their mother (Jane Wood) who discovered the Grinnygog. The Firkettles are joined in their curiosity by the Sogood siblings Colin (Giles Harper) and Nan (Heidi Mayo) who, along with the Firkettles, are in the process of setting up a parish museum. Matters become even stranger with the arrival of African witchdoctor Twebele Alabaster (Olu Jacobs) who appears to be an authority on Grinnygogs. And then there’s the small matter of a nervous, ghostly child who keeps appearing in the village. Starting off with a rather creepy theme tune, The Witches and the Grinnygog isn't half as scary as you would think. Instead, it's a gentle supernatural drama which finds the romantic idylls of a British village seeping from its every pore. And, in amongst the rather wooden child acting, we get to see the young Adam Woodyatt strutting around and clearly destined for bigger things. The Witches and the Grinnygog was a 1983 TVS production based upon the 1981 novel of the same name by Dorothy Edwards. Transmitted in a 4.45pm slot as part of Children’s ITV, six 25-minute episodes were adapted for television by Roy Russell and directed by Diarmuid Lawrence. 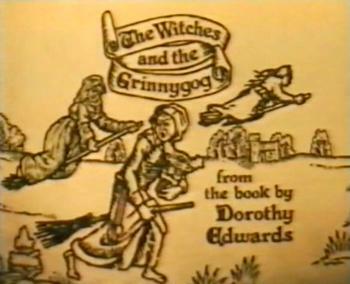 The Witches and the Grinnygog did not receive a terrestrial repeat, but was shown on The Children’s Channel in the 1990s and also aired on Nickelodeon in the United States during the mid-1980s. Hosted by race marshal (aka question master) Roland Rat, Roland’s Rat Race is a head to head quiz show which pits two regional teams against each other. Each team is allocated to either Kevin the Gerbil or Little Reggie and, in the second series, the scores are kept by Stan (Roy Sampson) until Roland fires him and brings in Nicholas Parsons for the semi-finals onwards. Teams are made up of three members with each one bringing a specific area of knowledge to the table: one is a know all, another is a pop fan and the final member is a rat fan. When team members are called up to go head to head in the various rounds (or laps) they take their place in racing cars and have to buzz in on questions such as “What is an albatross?”. The aim of the game is to score as many miles (points) as possible in order to progress through the initial heats and into the knockout rounds. Series two also brings in a round which involves the teams having to watch an excerpt of Roland’s spoof Sherlock Holmes serial ‘Dial R for Rat’ and answering questions on what they’ve just seen. The final round dispenses with the racing cars and, instead, features all the team members in a quickfire quiz round designed to ramp up the mileage. The penultimate series that Roland Rat made for the BBC, Roland’s Rat Race is an uneventful, yet harmless quiz show which provided Roland with plenty of chances to deliver his trademark wisecracks. As ever, Roland was operated by David Claridge who also co-wrote the episodes. 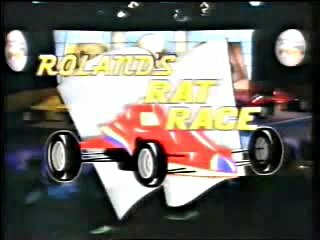 Two series of Roland’s Rat Race were produced with the first series containing 16 episodes and the second series having a reduced run of just eight episodes. Both series went out on Saturday mornings at 8.40am with neither of them receiving a repeat airing. Roland’s final series for the BBC, following this one, was directly inspired by the ‘Dial R for Rat’ sections and went out as Tales of the Rodent Sherlock Holmes in 1990. In the land of Do As You’re Told, there lives the short, red ball of fluff Stoppit and his good friend Tidyup who is much taller with a purple rotund body, long head and a necktie to complete his look. Within the world of Do As You’re Told, which is packed full of rubbish, giant gherkins and fauna, Stoppit and Tidyup are joined by a motley crew of characters named after the kinds of instructions frequently barked at children by parents: BeeHave and BeeQuiet, Don’t Do That, I Said No and Eat Your Greens. As all the characters are only able to communicate in an unintelligible jibber-jabber, Terry Wogan is on hand to provide narration. Narratives awaiting our characters include Tidyup catching Naughtypox, I Said No and Not Now stealing everyone’s gherkins and Go To Bed desperately searching for a quiet place to sleep. Stoppit and Tidyup is a gloriously surreal children’s animation which would bamboozle any non-native watching it for the first time. Packed full of Rubenesque bees and dirty little critters, Stoppit and Tidyup truly lets its imagination and designs off its creative leash with a series of unconventional and abstract adventures. 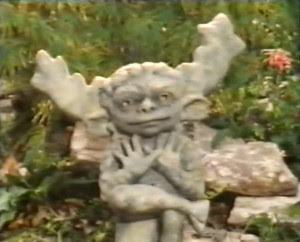 Stoppit and Tidyup was created by Charles Mills and Terry Brain who had previously created The Trap Door, ITV’s legendary tale of monstrous goings-ons. Mills and Brain also wrote the 13 5-minute episodes alongside Steve Box who would later work extensively for Aardman Animations. Episodes originally aired as part of the Children’s BBC schedule and were broadcast at 3.50pm on Monday afternoons. Repeats of the series continued up until 1995. That's it for now, but the good news is that I'm heading to the BFI Viewing Rooms to watch several highly obscure shows to help boost the oddity quota of future editions of The Forgotten World of British Children's TV. Of these, I only recall 'Roland’s Rat Race' and 'Stoppit and Tidyup'. 'Rat Race' wasn't a particular favourite but was harmless enough to pass the time and I tuned in occasionally; I liked RR's previous BBC series, 'Ratman', much more. I was beyond the intended age range for 'Stoppit and Tidyup' by the time it was shown so didn't really watch it, I just remember the main point of note that it was narrated by Terry Wogan. 'Paperwise' I don't recall (though was born in '78 so may well have seen later episodes), though being very creative and craft-y even as a boy sounds like something I would have loved. 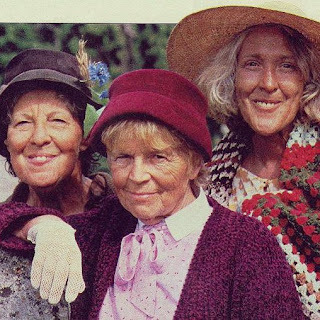 I'm not sure how well 'The Witches and the Grinnygog' would have been actually on-screen, but the concept of it sounds very good (and a decent cast too), I might have to do a bit of YouTube searching on that one. 'Wizbit', rather bizarre magic and puzzles affair narrated by Paul Daniels and with people in large padded costumes. Sometimes voted in newspaper features over the years as "the worst kid's TV show of all time", though I think it's more standout "what the hell?!" than out-and-out bad (considering some of the tat we've seen over the years) and an easy one for them to go for as they can have a pop (admittedly irritating) Daniels... until he died and naturally, they decided they liked him! 'Pie in the Sky' - not the Richard Griffiths drama series, but a similarly (to Wizbit) bizarre "what were they thinking" offering for younger children, involving putting songs into pies and offering up to some weird space fella in the sky. Yes, really. (Just don't a quite search and CBT already has a great article on this series). 'Coppers and Co' - comedy series which I believe was a sort-of follow-up / spin-off to similar-titled sketch show 'Lift Off with Coppers and Co', starring David "The one out of 'Three of a Kind', not the magician!" Copperfield playing a sit-com version of himself, his dimwitted caretaker mate Tony, and a woman who kept bursting in from next to try and impress him, hoping he could make her a star. One ran for one series I recall, but I really liked it. One episode, 'Catman and Dobbin', I recorded on cassette tape (gawd knows why as we'd long had a video recorder by then) and listed to many, MANY times (and still have somewhere); I must know ever word of that bloomin' episode. As well as the many classic BBC 5:10(ish) p.m. dramas of the age which I've mentioned before; I wonder if 'Friday Film Club' could be included on a technicality. It was a (Friday!) slot for showing old Children's Film Foundations Films, generally ranging from the early 1970s era up until the then-modern day. Classics such as 'Pop Pirates! ', 'Cry Wolf' and the legendary 'Sammy's Super T-Shirt' were included; as it was shown weekly as a packaged "series", might be able to included it on the site as aforementioned technicality. Amazing work, have you found any episodes of an oddball cartoon show named Murun buchstansangur? 5 minute episodes aired between programmes on channel 4 from 1982 up to the early 90s. 52 episodes but can only find a handful online! Yes, I found an episode of Murun about 18 months ago, it's up on my YouTube channel somewhere. Episodes of it are quite hard to come by. I think there's only a dozen (at most) on YouTube.